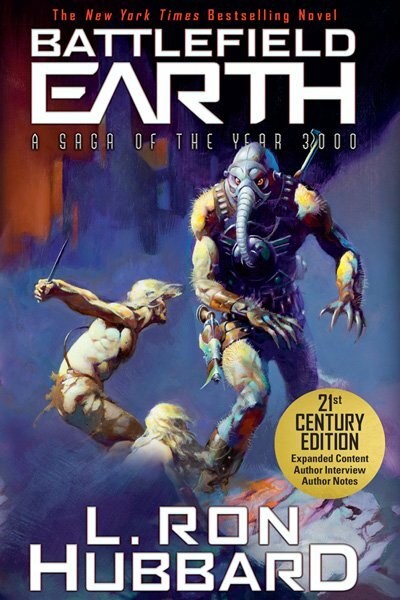 According to the science fiction novel Battlefield Earth by L. Ron Hubbard, the answer is yes. In the novel, the Psychlo invaders consider Earth part of a “rim star system,” way out on the edge of a galaxy in the 16th universe. This was the last universe to be discovered by their race and was never wholly mapped. And Earth might have gone overlooked had it not been for the Voyager probes. Instead, with the discovery of the gold disks they carried, the Psychlos invaded, gassed the planet and wiped out most of the population so they could mine Earth for gold and its mineral resources. Pretty much a routine matter for the Psychlos and all in the name of intergalactic mining, profits, and banking. From their perspective, they owned the intergalactic rights and through the power of gold, they could secure control of whole planets and galaxies. To find out what happened, download the first thirteen chapters for free. 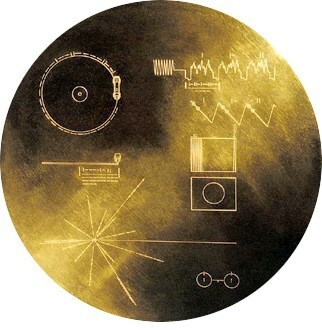 Attached to the outside of Voyagers 1 and 2 is the Golden Record, inscribed with a map showing our solar system’s position relative to its 14 nearest stars. The record includes images, scientific information written in a universal language, greetings in 55 languages, a collection of music and a message from the then President of the United States, Jimmy Carter. Here’s a video of the 116 images NASA wanted aliens to see. Both spacecraft will continue to drift for billions of miles carrying their message to any intelligent spacefaring civilization that might happen to discover them. Where is the Voyager Now? 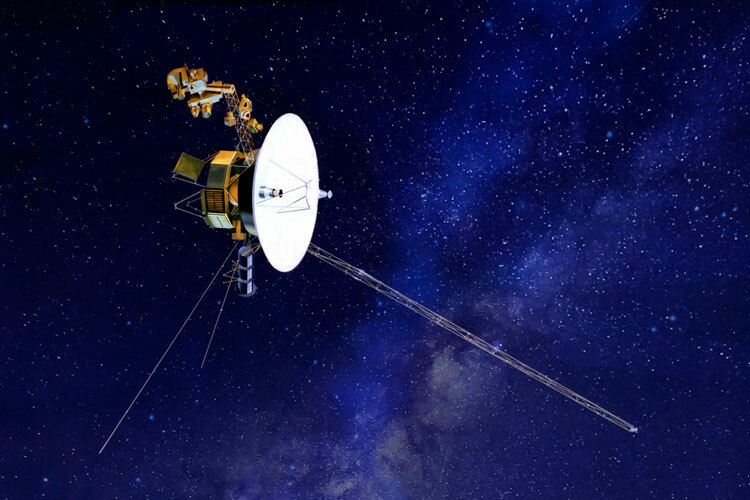 Today, the Voyager 1 and 2 spacecraft probes still receive routine commands and return data to Earth. They are not expected to lose power until the 2020s. Voyager 1 became the first spacecraft to enter interstellar space in 2012 and Voyager 2 is now traveling through the outer layers of our solar system. At their current speed of 10 kilometers per second, it will take roughly 40,000 years to go from one star to another. So chances of a sufficiently powerful radar being able to detect them seem unlikely. Not everyone believes it was a mistake to send out the coordinates of Earth. With what we know of the galaxy and the number of inhabitable planets there could be, some think it is dangerous to freely broadcast our exact location. Hostile aliens, like the Psychlos in Battlefield Earth, could be the end result. Others think the method used to design the map was clever but inherently flawed as long-term changes in space will render the map useless. Possibly by the time anyone finds it, they will encounter a riddle that will be very difficult to decipher. Or, on the other hand, we could establish interstellar friendships with the likes of E.T. and the “heptapods” described in the 2016 movie Arrival. So, was it a mistake to send out a map of Earth’s coordinates? No! We are much too far away from the next closest life forms to ever have a probe like Voyager contact anything; Especially something with bad intentions. Totally impractical! Mountains of data indicate otherwise. Which mountains of data? In fact, data suggests exactly the opposite. I think it’ll be fine. Bad or good. At least we’ll know we are not alone. What’s far away when you have worp speed. I could have accepted your scientific analysis had you spelled warp correctly. LOL! That was exactly my thought as I read it! The encounters with aliens I’ve read about show no evidence whatsoever that these beings are friendly. Quite the contrary. Apparently they treat their “victims” as our scientists treat our animals. Inspecting, probing and never once considering the feelings or trauma being caused by the alien “scientist”. Per these stories by those who have undergone “being taken”, ET, as in the movie, is surely an anomaly. I certainly would not try to shake hands with one. Who has and had a pleasant experience, besides in the movies? Why would you assume the aliens would be hurtfull to us. Just because of the movies you watch or stories you read. You do know all those are fictional. And people who say they had those experiences are liars. They most likly had a near death or a death experience. And caused them to think this. I was clinically dead for a few minutes twice. And saw things I had no idea of. But not aliens. We sent our information out into the unknown, that is dangerous no matter how u look at it ! Here on Earth only the strongest or most intelligent survives why should nature be any different out there. While no one knows for certain (until possibly too late), I personally agree with your comparison to how things happen here on Earth. Why would anyone assume that aliens would not be hurtfull to us? Are we ready to take that risk? I say we should avoid any contact with aliens. In fact I believe that if aliens are allowed to land, that’s the end for us. Hi Les, I must admit that I agree with you. It is a fairy tale (not Grimms) to assume that alien life form would be any different than us in dealing with lesser life forms. Morbid curiosity here…what did you see? What was put on the disk was silly, but the question of the article is moot. LRH had already done the research in 1952! Anyone can read his books and listen to his lectures and find out what he discovered. And by all accounts – except the official account – they have already returned. They know where Earth is and what Earth is and they have for millions of years. If you have the technology to travel that far though space I don’t think they have to or need to probe anyone. Unless they are just perverted . in which case plenty of humans are perveted all ready and will join them freely!! That second concept you just voiced is scary indeed! It would be nice to know who these aliens are. Within our Mikky Way Galaxy there may be 100’s if not thousands of inhabited world’s. Many of them may contain humanoid type beings. Others may have different life forms. Some of them may be far more advanced in the technology or their intellectual property. All it would take would be one of the advanced races to be out on space patrol and spot our Voyagers and seize it. It has gold wrapped around it. Gold may be scarce n very pricey around their home planet. Here’s this little thing with gold and a map to where they can get more. I wouldn’t take long for some greedy aliens to follow the map and show up here and find out where the gold is and realize we have no defences. Be an easy take over. Now if they were friendly, they’d have to come and integrate among us and then Rob us nicely of our gold and precious metals. Either way is a possibility and a chance we take when we send it small satellites with gold on them and a map to where and who we are sitting our here with no defences against an attack from these high tech beings. See Battlefield Earth for the destructive aliens. See Mission Earth for those could infiltrate among us. Enjoy them both. Well, for those who wish to keep all this in the realm of fiction, perhaps is is just as well. While we have some idea what the society that set up Earth, current iteration, was like – and many other such societies as well – we have no guarantee that the ones visiting now are the same as those we remember. Without any broad-scale interaction with them we are at the mercy of the story-spinners. So it might as well all be fiction. Though the story-spinners have included several accounts of Earth actually preparing quite thoroughly for ET contact – in secret – I would feel more comfortable personally if I were more certain about the level of truthfulness in these various accounts. Any aliens that have the technology to travel vast distances are surely evolved way past our human evolution and technical development. In laymans term could you communicate with a slug? A slug cannot comprehend what a human is and the technical advancement we have, because a slug’s brain does not have the capacity to do so. slugs would see us as Gods. is exactly what we are to an advance alien race. The universe is RIFE with resources, gold or otherwise…. No neeed to destroy a sentient civilization in order to get your hands on more. We were ok till Chuck Berry died! Now they will be pissed when they show up and Chuck is not around! You never know. The aliens who find it might not think gold has much value. Their planet is rich in gold. The steal or iron on the probe might have more value to them because their planet has very little iron. According to the Sumerian’s they are already here and bred modern day humans, to mine gold for them. Jim Marrs used to talk about this on interviews he would do for us talking about Battlefield Earth as well as the subject of aliens on Earth. I think his book was “Alien Agenda” that went into this subject. What’s to say one of the Voyagers hasn’t already been found, the information deciphered and that we have been determined to be unworthy of further exploration? Or this planet quarantined because it is so whacky! L. Ron Hubbard wrote a book called Mission Earth which explored the idea of EArth’s insanities being exported to other worlds, nearly destroying them, and so Earth being erased from astral charts so no one else connects with them. This is designed to make us all think that ETs aren’t already here. The new proposed Space Force is a soft disclosure of what have been going on for decades. Some of you will be totally shock by the deception we’ve been under. I am sure that in an earlier time, Chuck Berry could have been thought to be an alien too! Don’t play a Slim Whitman song their heads will explode! I missed out on Slim growing up, so had to quickly watch some YouTube videos to see what you were referencing. It’s amazing how much music has changed since 1967! That music would drive any space people away as it’s as if we’re all some kind of backwoods people. Kind of an odd twist to the “War of the Worlds” theme that bacteria on Earth won the day. Now it’s Chuck Berry that wins our continued freedom! When we develop interstellar travel we can go pick them up before they’ve gone too far if we choose to. A definite possibility provided they haven’t already been picked up otherwise — as mentioned in the opening of Battlefield Earth (the premise of the story). From one (a man)who was on tv around the 60’s or 70’s spoke on national telavision and stated something to the likes of (the best way to hide something, is to hide it in plain site) whome also had a person dressed up in an alian costume standing next to him by tbe podium. I also heard on a video one time basicly the best way to break the news to the world about alians being here without freaking people out, was to brake it to us slowely, like what they’re doing now all over the media. Ive watched videos and dug deep for years, ive seen a so called ufo in Miami Florida, i know without any doupt we are not alone, even on this earth. That is definitely a good way to hide something (in plane sight). The other thing to do to keep something hidden is to make it so unbelievable that anyone asserting it is made to look the fool. Real observations of UFOs are surrounding with fake UFOs and charicatures of aliens that renders any discussion of UFOs and aliens as nonsense. Breaking the news little by little to sensitize a population may bring about awareness as you state. But it might also just be that as we send more and more people into space and tackle Mars in the next several years, that the fact of UFOs will be fully realized. Regardless of whether they are here or coming here we had better get off of this Black thing ,White thing ,Red thing or Brown thing and get it together as Earthlings. History has shown that a people fighting among themselves,are easily conquered. That is absolutely true. The easiest way to dominate a population is to keep them so involved with in-fighting (which becomes a separate topic of the continued effort to keep us fighting each other) and with such internal strife, even a moderately effective opponent can easily overwhelm and conquer. The way I see it is if any technically advanced alien race capable of deciphering the messages on the Voyager missions would be intelligent enough not to “destroy” another race or interfere with they’re development.Simply because of their intelligence. In other words, let’s hope they aren’t like us! The more technically advanced we have become as a race, the more that the small destrcutive percentage of the race are able to reek havoc on a broader scale, e.g. atomic bomb, psychotropic drugs. We have definitely had no qualms destroying lower life forms on this planet. Why should a superior alien lifeform not view us any different than the Passenger Pigeon? It will be 40,000 years before it gets as far as the closest star, and it will be nowhere near any stars for millions of years. It is small and space is very big, the odds of someone finding it are very small. Thanks Chris. The odds are very small with our technology, for sure. When we have the technology, we should shoot the voyagers down ourselves before it is too late.